Hundreds of jellyfish have washed ashore in Jacksonville Beach. 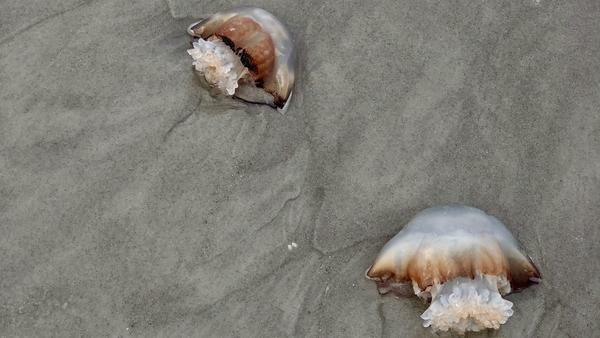 If you were at Jacksonville Beach Sunday, you probably had to dodge hundreds of jellyfish. WJCT News partner News4Jax reports jellyfish usually wash ashore this time of year, according to WJXT meteorologist Mark Collins. Jacksonville Beach lifeguards told News4Jax a huge number of jellyfish washed ashore with the swell from the waves. Jellyfish are mostly made of water so they die quickly after washing ashore. They can still sting but it is very mild. If you find a jellyfish washed up on the beach then it is probably dead but be warned, they can still give you a sting if handled. Jellyfish don't go after humans, but someone who swims up against or touches one — or even steps on a dead one — can be stung. While jellyfish stings are painful, most are not emergencies. • Carefully pluck visible tentacles with fine tweezers. • Soak the skin in hot water. Use water that's 110 to 113 F. If a thermometer isn't available, test the water on an uninjured person's hand or elbow — it should feel hot, not scalding. • Keep the affected skin immersed or in a hot shower for 20 to 45 minutes.